For much of its life, the Kia Optima has been firmly pegged as an also-ran vehicle. Introduced as Kia's first midsize sedan, the first-generation Optima couldn't promise the refinement, documented reliability and assured resale value of its key Japanese competitors. The second-generation Kia Optima followed much the same playbook, though with considerably better results. 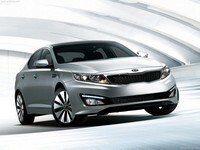 Kia's latest, third-generation Optima is an also-ran no longer. With sleek styling, plenty of standard features, potent engine choices and substantial value, the current Optima is a top pick for a midsize family sedan. The current Kia Optima is very similar to the Hyundai Sonata, but to Kia's credit, the Optima has a distinctive European flair to it. From the outside and inside, the Optima looks and feels like a much more expensive car than its humble price tag would suggest. The completely redesigned Optima features a much sleeker, sportier profile designed by new Kia design chief Peter Schreyer. The second generation Optima, known as the Kia Magentis globally except the United States and Malaysia, and as the Kia Lotze in South Korea, was launched in South Korea in November 2005. From 2000-2005 Optimas were a rebadged variant of the Hyundai Sonata, differing only from the Sonata in minor exterior styling details and equipment content.